Whether you have a flooded basement or a flooded home, we fully understand the urgency of getting the flood water extracted as soon as possible. That's why we offer 24 hour emergency flood damage response - because the sooner you get the water out, the less flood damage you'll likely incur. Experts say that the worst flood damage occurs when water has been standing in your flooded basement or flooded home for more than 48 hours, which means timing is everything when a flood occurs. Flood Water Extraction Our flood water extraction service is first rate. We only use state-of-the-art equipment and techniques to get the flood water out - now! Serious water damage, such as with a flood, requires serious attention to ensure that not only is all of the flood water extracted, but also that all of wet areas are dried completely and treated quickly to minimize lasting water damage effects. If the flood water extraction is not performed quickly, the water damages to your property could become very severe! 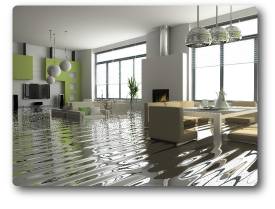 We understand the need to keep your water damage restoration cost as low as possible. Therefore we make sure the extraction of water is performed in a timely manner. This will greatly minimize your restorative costs and reduce your chances of developing a mold removal problem. It is imperative that furniture and carpet is treated right away to decrease the opportunity for microbial growth to occur. Personal property also has a greater chance of surviving the flood if it is attended to right away. Most importantly, however, all electrical components that may have been soaked by water MUST be attended to right away to avoid the potential for dangerous electrical short circuiting. Don’t delay! Time is of the essence! DryMaster has technicians in your neighborhood - give us a call today.